The New Forest is a National Nature Reserve situated on the south coast of England. 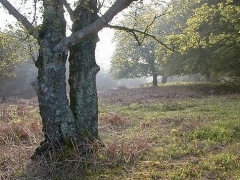 The landscape is a mix of heathland, grassland, bogs and woods. Domestic animals are permitted to roam freely throughout the Forest. Visit Beaulieu Motor Museum, catch a ferry from the pretty town of Lymington to the Isle of Wight or just enjoy the many cycle trails, walks and forest villages. If you enjoy walking in the countryside and wish to see some of the wildlife that the New Forest and surrounding area has to offer then why not contact Project Fred. Project Fred is a family-run business which offers relaxed nature rambles within the beautiful scenery of Dorset, Hampshire and the New Forest. This area holds a wealth of wildlife that includes many rare species, some of which are found nowhere else in Britain. Find the rare birds, elusive orchids, beautiful butterflies and dazzling dragonflies. The walks are led by Simon Curson BSc, a trained ecologist with over 10 years’ experience in teaching wildlife and leading guided walks.